Jean Guyon, the owner Chateau Rollan de By did not start out life seeking a career in wine. At first, he followed his father and grandfather as a seller of antiques and as an interior designer. But the world of wine caught his interest before his 30th birthday. Chateau Rollan de By is a relatively young estate. The vineyard began earning a reputation when it was purchased by Jean Guyon in 1989. At the time, Rollan de By was a diminutive estate with only 2.5 hectares of vines when is was initially created. Under the direction of Jean Guyon, the property has increased in size almost 20 times! Over the years, Jean Guyon has also added other Bordeaux value wines to his holdings including Chateau Haut Condissas, Chateau Greysac, Chateau Tour Seran and Chateau La Clare. In 2012, Jean Guyon purchased one of the most famous Cru Bourgeois estates in all of Bordeaux when he took control of Chateau Greysac. In 2014, Jean Guyon produced an upscale version of his 5 different wines sold as The Collection Or. Led by Rollan de By, the bottles used in the collection are all made from opaque, black glass etched in gold. Due to their ornate packaging, they are the most expensive Cru Bourgeois yet released. The boxed set includes Larose Trintaudon, Greysac, Tour Seran and La Clare. The 45 hectare vineyard of Chateau Rollan de By is planted to 70% Merlot, 10% Cabernet Sauvignon, 10% Cabernet Franc and 10% Petit Verdot. They have a terroir of clay and gravel soils. All the clay in the soils explains why there is so much Merlot planted here. 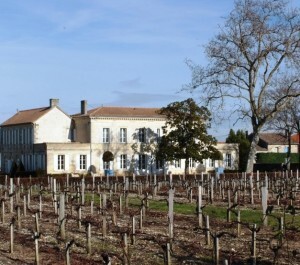 The vines at Chateau Rollan de By are old, with an average age of 35 years. The vineyard is planted to a vine density of density that ranges from 8,500 vines per hectare up to 11,000 vines per hectare. Before being purchased by Jean Guyon, the vineyard of Rollan de By had more Cabernet Sauvignon in the vineyard. It was the decision of Jean Guyon to decrease the amount of Cabernet Sauvignon in the vines and add more Merlot, due to the high concentration of clay found in the soil as we mentioned previously. The vinification of Rollan de By takes place in temperature controlled, stainless steel vats. Malolactic fermentation for the Cabernet Sauvignon takes place tank, while the Merlot and Petit Verdot go through Malolactic in French oak barrels. The wine of Rollan de By is aged in a combination of 90% new, French oak barrels and 10% new, American oak barrels for an average of 12 months. There is a second wine, Fleur de By. Chateau Rollan de By also makes a Kosher cuvee’. Alain Raynaud is the consultant. On average, 20,000 cases of Chateau Rollan de By are produced every vintage. Chateau Rollan de By also produces a small amount of white Bordeaux wine from 100% Sauvignon Blanc, using the aptly named moniker of Rollan de By Sauvignon Blanc. Chateau Rollan de By can be decanted for an average of 1 hour or so.This allows the wine to soften and open its perfume. Older vintages might need very little decanting, just enough to remove the sediment. Chateau Rollan de By is usually better with at least 2-4 years of bottle age. Of course that can vary slightly, depending on the vintage character. Chateau Rollan de By offers its best drinking and should reach peak maturity between 3-15 years of age after the vintage. Chateau Rollan de By is best served at 15.5 degrees Celsius, 60 degrees Fahrenheit. The cool, almost cellar temperature gives the wine more freshness and lift. The wine of Chateau Rollan de By is best served with all types of classic meat dishes, veal, pork, beef, lamb, duck, game, roast chicken, roasted, braised and grilled dishes. Chateau Rollan de By is a perfect match with Asian dishes, hearty fish courses like tuna, mushrooms and pasta as well as cheese. Licorice, tobacco, and red fruits along with soft tannins and an early drinking charm define the medium bodied wine. Polished red fruits and black cherries with softness, medium body and a forward attitude. Licorice, coffee bean, vanilla and ripe, dark berries are found in this forward, easy to like, crowd pleasing wine. Blending 70% Cabernet Sauvignon, 25% Merlot and 5% Petit Verdot produced an earthy, vanilla, cassis and licorice flavored, medium bodied wine that’s already fun to drink and value priced as well. Espresso with black and red fruits with herbal aromatics make up the perfume. Medium bodied and okay on the palate, the wine ends with a dusty, cassis finish. Coffee, chocolate, boysenberry and tobacco scents lead to a medium/full bodied, round textured, crowd pleasing style of Bordeaux wine that is ready to drink.